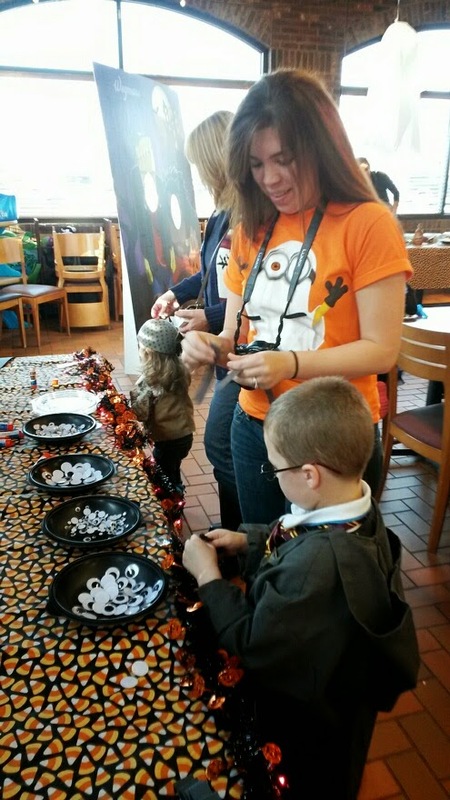 We had the fun of attending the Wegmans Halloween Party for kids this year! I wanted to try out something new and since we enjoyed the Organic event so much I hoped we would like this too! They had some great Halloween snack, drinks & fun names. They set it up in stations to help things move along and for the kids to spread out. First we tried corn toss & spin the wheel. We won Organic juice from this, love it! Then we made some Spider hats. So we dug in and made our little hats!! I just love this fun wholesome kid activity. Next was a cute photo prop which as you should know by now we LOVE! I especially love the Halloween recyclable bag because we own one just like it. Then on to the Apple bar...think Caramel covered slices. Then last up we decorated cookies. I have to say Mac did so well with this I might institute these bar ideas at kid parties form now on. If you have an opportunity to attend these types of events I really encourage you too! They are worth the few dollars and kids have so much fun. Ahh, how much fun does that look!!! I'm glad you guys had fun!! Sounds like a great event for kids. The photo prop was amazing! That looks like so much fun. I didn't realize Wegmans did a Halloween party. My mom has one near her, but we don't have one too close. Hopefully we'll get one soon!